The newest cohort of veterans — those who served in the U.S. armed forces since September 2001 — see considerably more connection between their military and civilian careers than earlier generations. About three-in-five (60.6%) of post-9/11 veterans said their military experience applied “a lot” or “some” to their most recent civilian job, compared with 41.1% of all veterans, according to a 2010 survey conducted for the Department of Veterans Affairs. 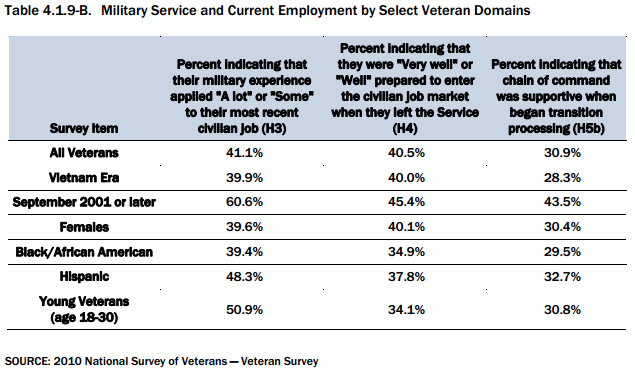 The same survey found that post-9/11 veterans were more likely to say they felt “well” or “very well” prepared to enter the civilian job market when they left the service, versus 40.5% of all veterans. However, only about a third (34.1%) of veterans aged 18 to 30 said they felt well- or very well-prepared. Of the 21.23 million living U.S. veterans in 2012, about 2.75 million (12.9%) served at some point after September 2001, according to Census Bureau estimates. The unemployment rate among those veterans was 10% last month, versus 7% for the entire civilian noninstitutional population, according to the Bureau of Labor Statistics. The largest subgroup of veterans remains those who served during the Vietnam War: more than 7 million, accounting for nearly a third of all veterans. According to the VA survey, about 40% of Vietnam-era veterans felt their military skills applied to their most recent civilian jobs, about as many as said they felt well- or very well-prepared to enter the civilian job market.